Wow! This show’s cast read like a Who’s Who of North East talent. 3 ¾ hours of entertainment featured stars off the TV such as Johnny Vegas, Brenda Blethyn, Stephen Tompkinson, Angie Lonsdale, Jill Halfpenny, Pam Royle and members of the Auf Wiedersehen, Pet cast rubbing shoulders with musicians like Trevor Horn, Joe McElderry, Billy Mitchell and Ralph McTell in addition to West End stars like Ryan Malloy and Bafta winning Dave Johns. But that was just part of the picture as many of the NETG favourites such as Chris Connel, Pete Peverley, Rosie Ramsey, Steffen Peddie, Jessica Johnson, Viktoria Kay, Craig Richardson, David Nellist, Jason Cook and Paul Dunn, to name just a few, showed how versatile they are in both sketches and songs. Of course in a show which has the purpose of supporting new talent in the region, there was plenty of that on show too. 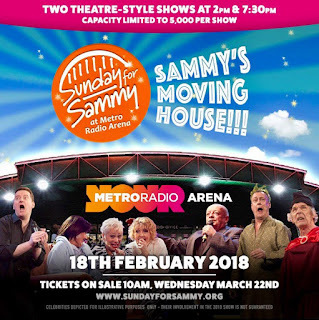 Sunday for Sammy, calls itself the Geordie Command Performance, and has moved from the City Hall to the Arena. Previous shows have sold out rapidly so the move has enabled more people to see this spectacle. It also helps to raise more funds for it’s charitable trust as double the number of spectators could attend. The show, held as a tribute to Geordie actor Sammy Johnson since 2000, has resulted in a Trust being set up which has helped young local performers with their professional development with nearly £½ million in grants. Such funding has been used to help set up the Blowin A Hooley theatre group and to help establish the Alphabetti Theatre. Sunday for Sammy is a celebration of North Eastern culture and many of the region's most popular and successful performers have taken part in the extravaganza of comedy and music, staged to raise funds to support the next generation of North Eastern performers with training, expenses and equipment. That’s enough about the background to the show… so what was the show like? The use of the Arena resulted in a big show feel in terms of a large stage, lots of lighting and massive video screens. After introductions from organisers Tim Healy and Geoff Wonfor the audiences were treated to Pete Peverley as the late Geordie comic Bobby Thompson, who died 30 years ago. He pointed out that not much had changed as the country was still being run by a female Conservative Prime Minister which raised a laugh. “Saint” Bobby made way for the first musical number as Billy Mitchell introduced Chelsea Halfpenny with her cover of Reach Out And I’ll Be There. The first comic to appear was the brilliant Steffen Peddie, who now has a regular slot on BBC Radio Newcastle, and he looked at the fun of after dinner speaking – or how to get banned from appearing at St James’ Park in under a minute. During the show we were to enjoy a number of sketches throughout the evening and Rosie Ramsey interviewing the Chris Connel as the owner of an Alnwick vineyard was a fabulous insight into how difficult the Northumbrian accent is for outsiders to understand. They were a great comedy duo along the lines of the classic Newman and Baddiel sketches from the 90s. 16 year old Tori Miller showed tremendous composure to play the piano and sing All Of Me in front of 5000 people. Last seen at the Newcastle NE6 Panto, Craig Richardson and Viktoria Kay once again had a chance to show their humorous side as Craig gave train announcements to Viktoria’s improvised sign language. One of the reoccurring sketches included a pair of grumpy arena stewards starring the comic talents of Jason Cook and Rosie Ramsey which would give That Peter Kay Thing a run for its money. Sunday For Sammy was willing the Geordie Nation to laugh at itself and this was particularly true when mountaineers David Nellist and James Baxter meet the loud and proud Geordie Lasses in the shape of Julia Tobin, Laura Norton and Chelsea Halfpenny. Having spent the past week in London and noticing, not only how the Londoners wear coats, they also have them fully zipped up when I felt it was quite mild outside. The idea that Geordie girls can just wear dresses whilst climbing a mountain and they just need to fold their arms if it gets cold is absurd – but that’s precisely why the humour worked. The first act also saw the first appearance of Auf Wiedersehen, Pet’s Kevin Whately, Christopher Fairbank and Tim Healy with the lads trying to get home from Miami Airport having been held hostage during their latest building work project. Tim’s son Louis Healy added the youth element. As the show progressed the lads fall over great wealth only for the real owner of the cash to come and reclaim it to be revealed to be Louis’s real life mother Denise Welch! It was a great bit of writing and comedy acting which shows how much of a classic the original series were. The first act had strong musical turns with blues from Ray Stubbs and Trevor Horn performing his classic Video Killed The Radio Star which had the Arena audience singing along. The act 1 finale comprised of a number of young dancers under Kristin Kelly Abbott’s choreography whipping up the football fans in the audience with a montage of some classic Newcastle United moments. Highlights of Act two included I, Daniel Blake star Dave Johns returning to his stand-up roots. Just like Steffen Peddie at the start of the first act, you wanted to hear more of his quick witted humour and it is a shame he left the show so quickly. Music in the second half included a duet of Nothing’s Gonna Stop Us Now between Billy Mitchell and Jill Halfpenny; Ralph McTell’s very timely rendition of Streets of London and proceedings reached a climax when Jersey Boys’ star Ryan Malloy and Joe McElderry sang Don’t Let The Sun Go Down On Me. Joe added a stunning rendition of Time To Say Goodbye which showed how, just like a good wine, Joe simply improves as time goes on. The high quality sketches also continued in the second half. Denise Welch, Charlie Hardwick and Angie Lonsdale gave us their Jazz Hands group. Not to be left out Tim Healy appeared in a very funny Speed Dating sketch with a number of northern actors. The sketch which kept on giving was the competitive Geordie Cops sketch. Johnny Vegas was about to carry out a post mortem with assistance from Jess Johnson. To observe the procedure, a roll call of some of the finest fictional crime busters appeared. Angie Lonsdale, Stephen Tompkinson, Kevin Whatley and finally Brenda Blethyn appeared to offer the bragging rights about who had the most successful role. As funny as they all were it was Jess Johnson who wasn’t fazed by proceedings and linked each character in turn wonderfully. This was a superb sketch and typical of the high standards of the evening. The evening finished with a Geordie Anthem in the shape of Billy Mitchell leading a rousing rendition of Run For Home. A fitting finale that had the Arena crowd on their feet singing along. It was a huge show which the organisers managed to pull off with aplomb. The next fundraising event is a DVD of tonight’s show which is available through all branches of Windows from the 13th April. We certainly will be picking up a copy. 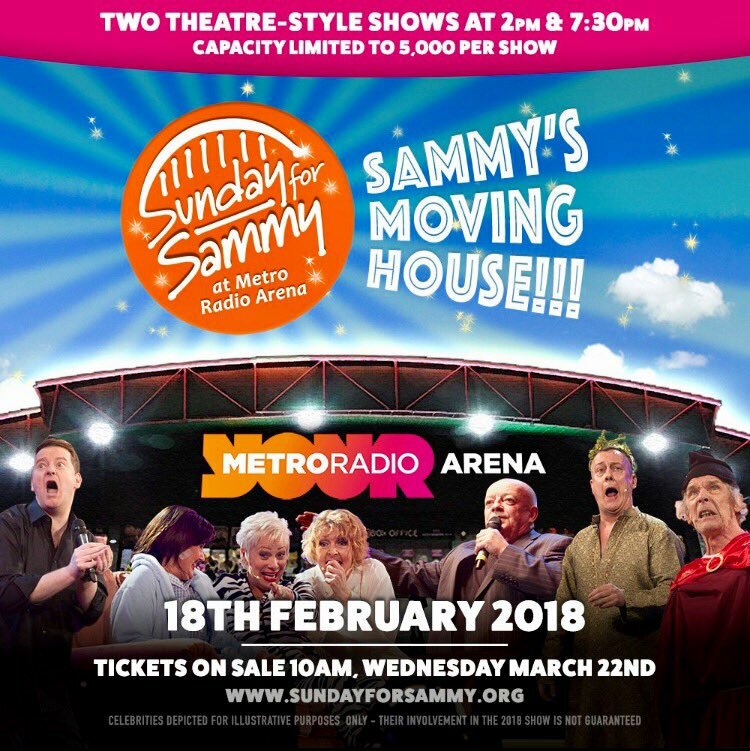 The next Sunday For Sammy show will be in 2 years time. Whilst the cast is not announced in advance, you can be assured of a great evening’s entertainment and it is for a good cause too. What’s not to like?